Star Wars Celebration is always such a special time for me. From meeting childhood heroes to hanging out with long time friends, experiencing unforgettable moments and more, there's nothing like being in one place with thousands of other Star Wars fans. This year's Celebration was no different! Celebration Chicago was the fifth time I've attended this event and I had such a great time. I love journaling all the highlights of my convention experience so I can look back on it in future years and remember everything I did. 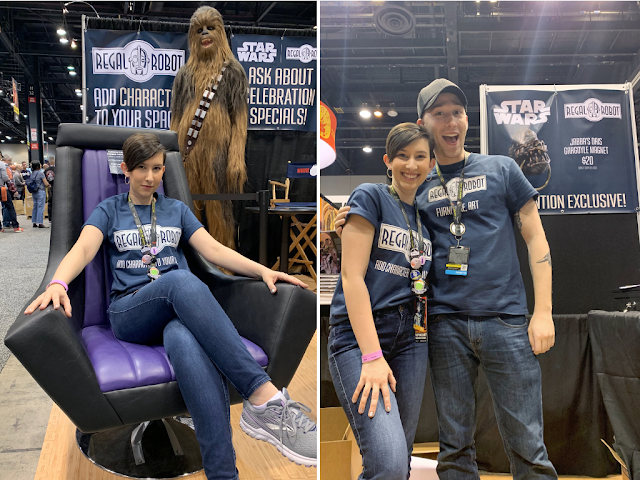 Here are the top highlights from my time at Star Wars Celebration Chicago! If you saw me on Thursday, Friday, or Saturday of the convention, you most likely spotted me at the Regal Robot booth in front of the Star Wars Show live stage. Regal Robot, founded by Tom Spina, creates licensed Star Wars furniture and home decor. 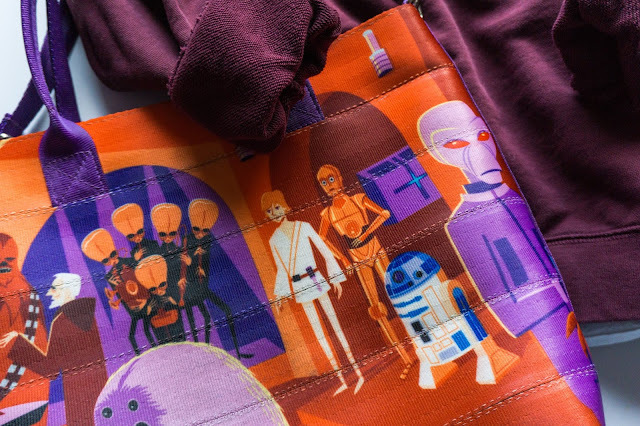 From off-the-shelf items to custom designed products, if you want to feature your love of Star Wars in your home, Regal Robot can help you do that. I had such a great time working with their team and getting to invite fans into the booth! They had a life size replica mannequin of Chewbacca on display for people to take photos with, but my personal favorite item to talk about was the Emperor's Throne chair. Just sitting in it makes you feel powerful! My brother was also working the booth so it was really nice to spend some time with him each day. I honestly don't even know how to talk about this because it's so incredibly overwhelming. Back at Celebration Orlando in 2017, I decided to host a small meetup for followers of my blog and podcast to hang out. I really only expected five people to show up last time and we ended up with at least 100 attendees throughout the night. This year, I organized another meetup and only expected ten people to show up. We had over 100 people meet with us throughout the evening! My amazing friend Melissa Thomas created some incredible Clone Wars inspired art for exclusive buttons that my co-host Brian and I only gave out at the meetup. We didn't have any left at the end of the night! If you came by even for just a few minutes or stayed all night, thank you. From the bottom of my heart! This meant the world to me. If you know me, you know that I love Kathy Kennedy, president and CEO of Lucasfilm, more than anything. I grew up adoring the Indiana Jones films that she produced, so her involvement with Star Wars in the last few years has been incredible for me to watch. I briefly had the chance to take a photo with her last year at the premiere of Solo: A Star Wars Story. Our encounter was so brief though that I didn't get to actually speak with her at the premiere. However, I randomly had the opportunity to quickly chat with her one day at Celebration before the exhibit hall opened. On Saturday morning, she was walking around the floor with her posse of Lucasfilm publicists and security guards. I dashed over to her and said, "Kathy!" She turned around and I said to her, "Hi, we briefly met at the Solo premiere, but I just wanted to tell you how much I admire you and how much I appreciate everything you do." She instantly gave me a hug and I started to well up with tears. I mean, it's not every day you get to tell your hero how much you love them! She said thank you and I went on my way. I dashed into the nearest restroom, called my best friend Lindsey, and gushed to her (while crying) about what had just happened. Lindsey loves Kathy just as much as I do so it was really special getting to instantly share that with her. When I finally pulled myself together, I checked my text messages and saw that my friend Chris Petescia was nearby and captured the moment. I hope that my few short words meant something to her, because it meant everything that I got to share with her how much her work has impacted my life. I had a reserved seat for Sunday morning's panel about the upcoming live action show, The Mandalorian. 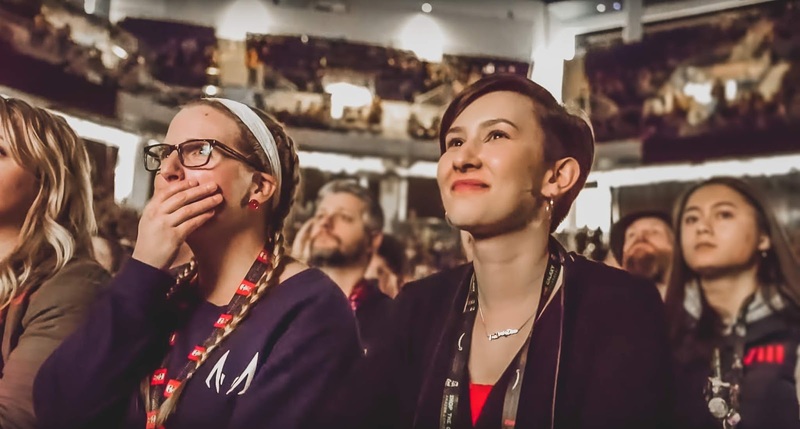 Rather than taking that seat, I decided to watch the panel at the Star Wars Show live stage with my friends Katie, Rianne, Anna, Emma, and Jim. 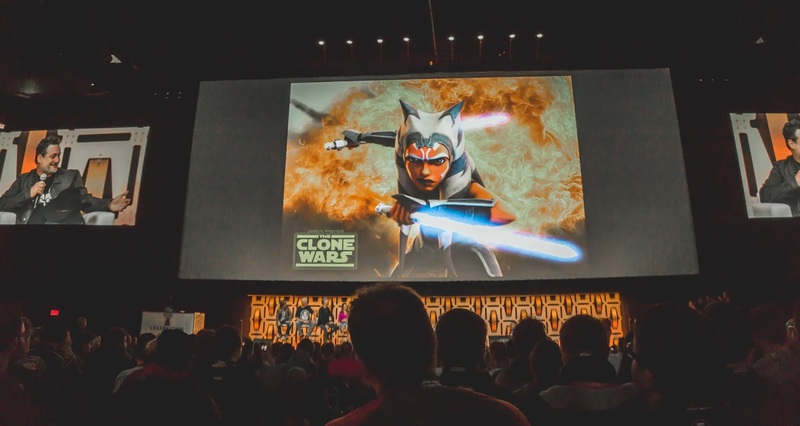 As a huge fan of Dave Filoni, I've been anticipating more information about this show since his involvement was announced. Jon Favreau, Pedro Pascal, Gina Carano, and Carl Weathers were on the panel along with Filoni. They chatted about their experience developing the show and describing the gritty nature of the story. 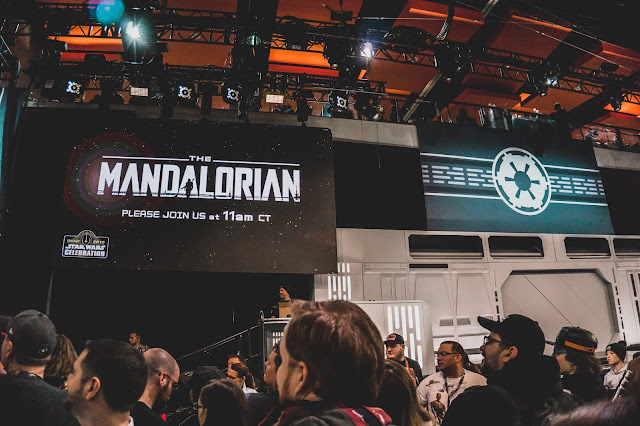 The livestream viewers at home did not get to see any of the exclusive clips of the show, but since we were at the event, we got to see a first-look at footage and behind the scenes content from The Mandalorian. Another scene and montage were shown at the end of the panel, but we did not get to see that. I can't wait for this show to debut on November 12 on the Disney Plus streaming service! Ugh, this panel. This was the main reason why I wanted to be at Star Wars Celebration Chicago. Star Wars: The Clone Wars is truly the reason behind my intense love for Star Wars. When I was in my early teens, I experienced Star Wars through the lens of these new characters' eyes and they showed me how Star Wars is a story of hope and perseverance. When I heard last year that The Clone Wars would be returning, I couldn't control my joy. Being in the main room for this sneak peak panel was really amazing. Dave Filoni and the cast of voice actors were on stage to share new clips with the audience along with a stunning trailer. My friend Ian who works for Lucasfilm captured my reaction to the trailer, which was just pure, awestruck happiness. I can't wait to watch these characters come to life again in the new season! No official premiere date has been announced, but I'm assuming it will next spring. Also, shoutout to my friend Katie for holding my hand when I was too emotional to control myself! I also had the pleasure of sitting in front of a Lucasfilm team member named Kevin, who was responsible for putting together that flawless trailer. There was so much love in that room! As a child of the 90s, I grew up watching the prequels and loving them with no shame. Getting to experience The Phantom Menace 20th anniversary panel was easily one of the greatest things I've ever done at a Celebration. Before the panel started, DJ Elliott pumped us up with the greatest 90s hits and there was no shortage of hilarious dance moves in my row! My friends Brian, Jim, Sarah, and Catrina were ALL rocking out to these songs. We were getting so amped for the panel to start. John Knoll, Doug Chiang, Jean Bolte, and Matthew Wood shared stories of their contribution to the created of the film while stars Anthony Daniels, Ian McDiarmid, Ray Park, and Ahmed Best reminisced about how this movie impacted their life. It was the most heartwarming thing to welcome Ahmed Best on stage during the panel. Ahmed played the technically groundbreaking character Jar Jar Binks, who didn't receive the most kind feedback once the filmed premiered in 1999, so it was really special to cheer for Ahmed and show him how much he is adored by us fans. At the end of the panel, my friends and I were chanting his name in unison and he clearly saw us in the crowd. I hope we made his morning a good one! In addition to all of those great highlights, my favorite part of the convention was meeting all of you! 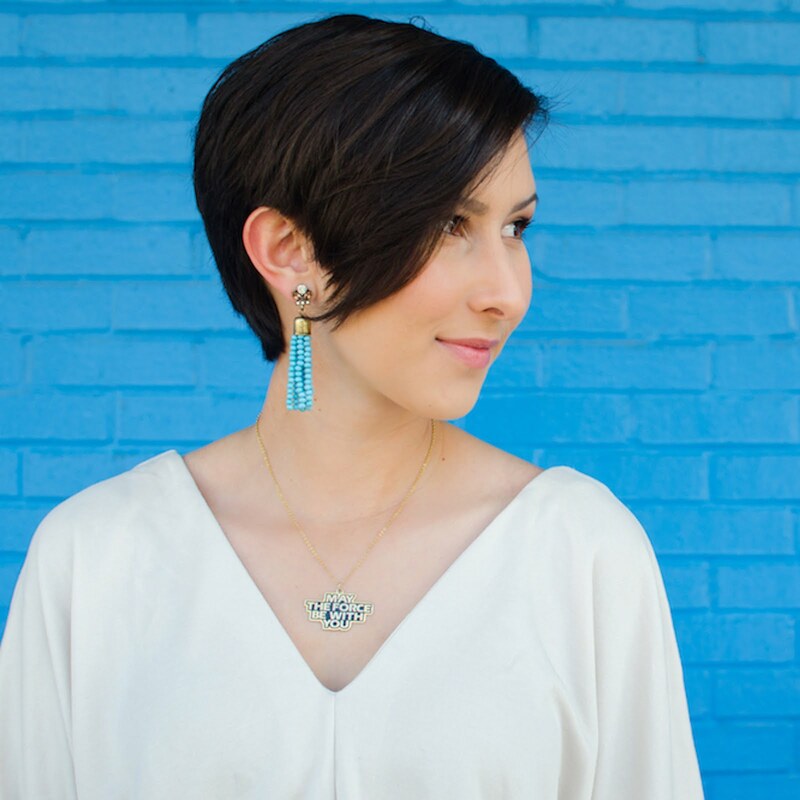 Whether you came to my meetup, found me at the Regal Robot booth, or bumped into me on the show floor, I'm so glad many of you came up to say hi and introduce yourself. It's always really rewarding for me to meet the person behind a screen name. Star Wars Celebration is slated to return in Anaheim next year and I hope to see you there! Oh and, I guess Emperor Palpatine is back? I'll try to condense my thoughts about that in the next episode of The Dorky Diva Show. Hah! See you next time.